Aphex Twin has a rabid fan base — earlier this year, a test-pressing of his Caustic Window LP sold for over $46,000. With that in mind, the artist born Richard D. James is likely stirring up some major fanaticism today, as he appears to be launching a worldwide marketing campaign. Most interestingly, as NME reports, a blimp was spotted hovering over the Oval Space in Hackney, England. The green blimp sported the year 2014, with the Aphex Twin logo appearing in the zero. Check out a photo of it above via FACT. Similarly, Pitchfork reports that an Aphex Twin logo was recently stenciled on the sidewalk outside of Radio City Music Hall in New York. In 2010, Aphex Twin said he had six albums in the works. "I've got six completed," he told Another Man magazine. "Two are very non-commercial, abstract, modular-synthesis, field recordings — those I finished four years ago. Another one is Melodies From Mars, which I redid about three years ago. There's one of stuff I won't go into; a comp of old tracks, which is never really finished and always changing; and then one I'm working on now. There are also loads of tracks which don't belong anywhere." 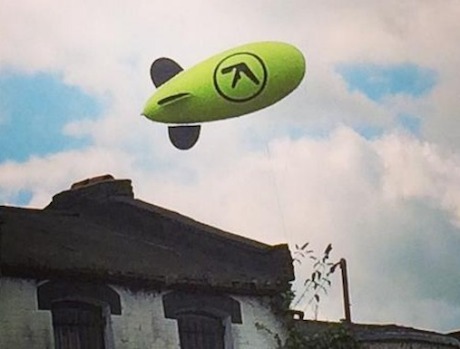 Stay tuned for more information on Aphex Twin's mysterious blimp, and any other news that may surface.